THE BLONDE LATTE: that girl is poison. Hat Flower/braid: Flower Gypsies:exact here! Bracelets: Pretty Southern: Shop here! Wave Ring: KulaKai exact here: click! Thank you Lauren! So exceptionally sweet as always! I really like the simplicity of your shirt and how the text is positioned. Great hat too! Thank you! You are so stylish & such a doll! Look forward to more of your posts! :) Hope you follow mine! 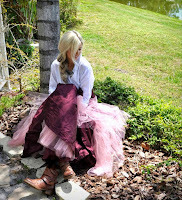 Gail You are so sweet I admire your style & love following your blog! I can't wait for more posts!